The day I had been waiting for, I had chosen this particular excursion to fit in as much as possible during our short stay here, I really wanted to go snorkelling at Silfra, a tectonic fissure filled with crystal clear glacial meltwater that offers unparalleled visibility thanks to its purity. A tour of the golden circle is one of the most popular activities for tourists on a short break in Iceland, and though it can get busy, we enjoyed a sunny autumn day with relatively few crowds. We were picked up by our guide in a minibus, just 10 of us in total, and headed for Geysir, a geothermal park around 1 hours’ drive from Reykjavik, passing some fantastic scenery on the way; steam rising from thermal pools, and even little elf doors painted onto rocks dotting the landscape. Here you can find Geyser (the namesake of all geysers), which is now dormant, but another nearby geyser, Strokkur erupts every 5-10 minutes, from 20m up to a spectacular 40m high. The small park there is full of bubbling hot springs, be aware that if you stand downwind of one you will get a distinct whiff of sulfur! There is a well-marked path around the park, so you can explore in safety and enjoy some fantastic views from higher up. After one hour there we head for the dramatic Gullfoss waterfall for more photo ops and amazing views. The waterfall crashes down into a narrow canyon and is an impressive sight that was nearly transformed into a hydro-electric plant before being sold to the state and is now protected land. From here we head to the third main attraction on the golden circle, Þingvellir (pronounced Thingvellir) National Park, seat of the first Icelandic parliament, and where the European and North American tectonic plates meet but are growing apart at a rate of 2 ½ cm per year. Again, we were given time to explore at leisure before heading around the corner to Silfra. The Silfra fissure has become a famous spot for snorkelling and diving in recent years thanks to the crystal-clear visibility of the glacial meltwater that fills it. The water is just above freezing at 2°C, so you are given a dry suit to wear (no swimming costume needed, just long thermal underwear! ), that consists of a padded jumpsuit and a rubber outer suit with rubber seals at the wrists and neck to prevent water entering. Those who are pregnant or have any kind of heart condition CANNOT TAKE PART just in case the water enters your suit. If you have any kind of medical condition check before you book if you can take part. There are no more than 6 people per guide and you spend around ½ an hour in the water, swimming through a deep, narrow channel that opens into a large lagoon. The visibility is astonishing, and your dry suit is surprisingly warm and buoyant. Those with their open water scuba diving certification can dive it. Before you know it, it is time to get out and head back to the van to change and enjoy a warming cup of hot chocolate. From Silfra it takes around 1 ½ hours to get back to Reykjavik. 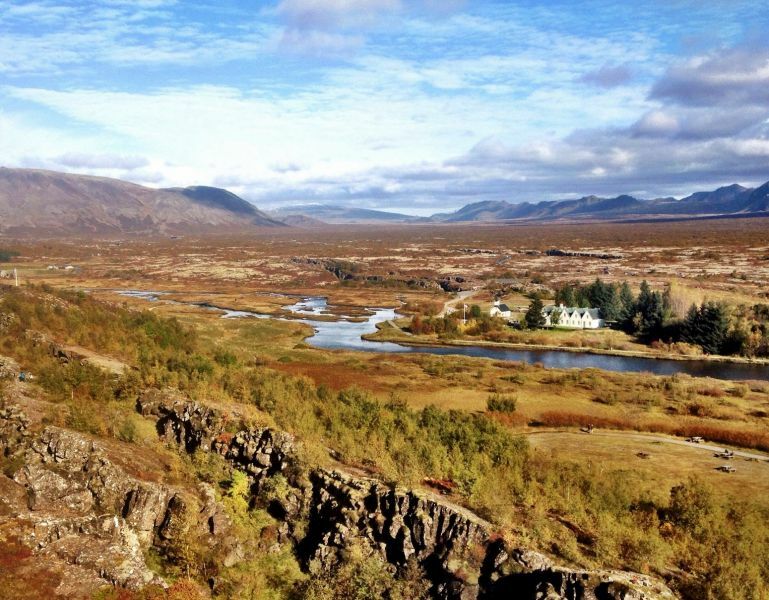 I recommend doing the Golden Circle + Silfra excursion – it takes the whole day but is completely worth it, if you’re planning to visit Silfra you might as well see the rest of the Golden Circle while you are there! Raufarhólshellir lava tunnel: Just 30 mins from Reykjavik, this large lava tunnel is a fascinating insight into the island’s geology. The South shore: Explore one of the most scenic areas of Iceland with the mildest (or as mild as you get in Iceland) weather. Visit the spectacular Seljalandsfoss and Skógafoss waterfalls, volcanic beaches and the charming town of Vik. If you are planning a trip to Iceland, contact us for a quote. We can tailor make a short break based on your requirements, or check out our adventure sightseeing tour. Want to know more about the northern lights and whale watching? check out part one of this post.